Who doesn’t like strawberries? They’re wonderful just to munch “neat” (whole or sliced). And they’re delicious when macerated and served with whipped cream over shortcake. Or baked into pies or tarts. Or churned into ice cream. You name it, their unmistakable flavor is one we crave. So when strawberry season rolls around, we indulge . . . and indulge and indulge. At the height of the season, when strawberries are plentiful and inexpensive, we in the Kitchen Riffs household tend to buy carton after carton. So many that, unless we do something with them right now, they run the risk of spoiling. 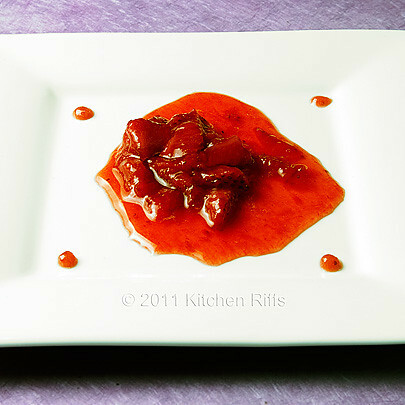 That’s often when we decide to convert excess, overripe strawberries into strawberry sauce. This recipe is simplicity itself. Just simmer cut strawberries with sugar and lemon juice for a few minutes and cool. Voilà! Strawberry sauce. This recipe makes about 2 cups of sauce per pint of strawberries. You can easily scale up this recipe to accommodate the quantity of strawberries you have on hand. Wash, hull, and roughly chop strawberries. I prefer a mix of big and little chunks. Place in saucepan, toss in sugar and lemon juice. Stir and bring to a simmer. Simmer for 5 – 8 minutes, stirring occasionally. You can substitute vanilla or almond extract for the lemon juice. You may want to add a pinch of salt to the mix. Taste after a few minutes, and if you think the addition of salt would improve the flavor, add it. I rarely find salt necessary. If you want a bright, bright red sauce, add some red food coloring. I like the color as it is, so I don’t. Strawberry sauce is great to have on hand in the refrigerator. You’ll find many uses for it. It’s a natural accompaniment to ice cream, either topping a plain bowl of vanilla or incorporated into a sundae. It’s also perfect for smothering angel food or pound cake. Or try garnishing a slice of chocolate cake with strawberry sauce for another classic pairing. And then there’s my personal favorite use: as topping for homemade meringues. 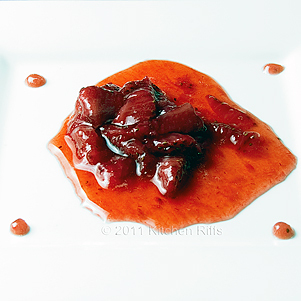 That’s how we’ll be using strawberry sauce in a post later this week. Hi Anonymous, it is! :-) Thanks for the comment.